Selection of immature CD4CD8 double-positive (DP) thymocytes for CD4 or CD8-lineage commitment is controlled by the interaction of the TCR with stromal cell-expressed peptide/MHC. We show that thymocyte-intrinsic genes influence the pattern of expression of a MHC class I-restricted transgenic (tg) TCR so that in DBA/2 mice, DP thymocytes with a characteristically high expression of tg TCR, infrequently transit to CD8 single-positive thymocytes. In contrast, in B10.D2 mice, the same tg TCR is expressed at lower levels on a subpopulation of DP thymocytes that more frequently transit to CD8 single-positive thymocytes. These characteristics were not influenced by thymic stromal components that control positive selection. Radiation chimeras reconstituted with a mixture of BM from tg TCR mice of the two genetic backgrounds revealed that the relative frequency of transit to the CD8 lineage remained thymocyte-intrinsic. Identifying the gene products whose polymorphism controls CD8 T cell development may shed new light on the mechanisms controlling T cell commitment/selection in mice other than the most studied “C57BL/6”-based strains. The T cell repertoire has been evolutionarily selected for reactivity against foreign Ags presented by self MHC molecules. Endowment of T cells with such a repertoire is based on their expression of TCRα and β chains on immature thymocytes expressing both CD4 and CD8 coreceptors (DP).4 This is followed by a differentiation step toward mature, “single positive” (SP) thymocytes that is coordinated with a selection process that ensures that CD4 or CD8 T cell lineage cells have potential for reactivity with peptides bound to MHC class II and class I molecules, respectively. Thus, for a given thymocyte to be selected at the DP stage, TCR engagement with appropriate avidity is required to escape cell death either by neglect or by negative selection. Within the range of avidities compatible with positive selection, it is not yet clear which parameter is determining for the commitment and differentiation to CD4 or CD8 SP thymocytes (1, 2). Recent studies have suggested that a critical parameter is the strength/duration of TCR engagement (1, 2). The question as to whether lineage commitment is totally dependent on or can be dissociated from, thymocyte selection is also still debated (3, 4). In addition to TCR interactions, other receptor-ligands have been suggested to play a role in determining thymocyte commitment. These include the Notch family members (5, 6, 7, 8), as well as some transcription factors (9, 10). In particular, the transcriptional repressor, Gfi1, was shown to favor CD8 thymocyte lineage selection (11), possibly through its control of the expression of the E box protein, E47, which was also shown to influence CD4/CD8 lineage decision (12). The expression of an antagonist of the transcription factor, GATA-3 (ROG), also favors CD8 SP and inhibits CD4 SP thymocyte development (10). Adaptive immunity thus benefits from these complex thymic processes to ensure that the T cell repertoire is prepared to react to most infectious agents while remaining tolerant to self components. T cell reactivity toward tumor Ags poses a particular case in that many of the identified tumor-associated Ags correspond to self MHC-associated peptides derived from nonmutated self-proteins. Two major types of such Ags have been identified that derive from 1) tissue-specific differentiation Ags or 2) a class of “cancer-germline” gene products, that, akin to the first identified MAGE gene, are encoded on the X chromosome and have restricted expression in gametogenic tissue and tumor cells (reviewed in Refs. 13 and 14). In the mouse, the P1A Ag (15) characteristic of such cancer-germline genes, has been shown to be the major rejection Ag of mastocytoma P815 in DBA/2 mice (16) and is known to encode a nonapeptide presented by Ld to CD8 CTL that can kill P815 cells (17). As a tool to trace CD8 T cell reactivity toward the model cancer-germline Ag P1A, we generated mice expressing as a transgene the TCR (TCRP1A) from P1A-specific CTL clone P1.5 of DBA/2 origin (17). We were struck by the poor selection of the TCRP1A CD8 T cells on the DBA/2 background. We further observed that upon backcrossing to the B10.D2 background, selection of TCRP1A CD8 T cells was improved. It was thus possible that the strain of origin provided a particularly poor selection context for the P1A-specific TCR. This possibility was investigated in radiation chimeras where TCRP1A bone marrow (BM) precursors differentiated in either DBA/2 or B10.D2 recipients. Our results reveal a hemopoietic cell-autonomous difference in differentiation patterns of TCRP1A thymocytes, independent of the thymic microenvironment, and controlled by DBA/2 vs B10.D2-encoded genes. The particularly poor selection of the MHC class I-restricted TCRP1A in DBA/2 mice therefore appears unrelated to its specificity, but rather highlights strain-dependent differences in thymocyte differentiation. Mice heterozygous for the Ld/P1A-specific TCR transgene (TCRP1A) on the DBA/2, B10.D2, and RAG-1°/°B10.D2 backgrounds (TCRP1A DBA/2, B10.D2, and RAG-1°/°B10.D2, respectively), nontransgenic littermates (non-tg), wild-type DBA/2 (Charles River Breeding Laboratories, Les Oncins, France), and B10.D2 mice (Harlan France SARL, Gannat, France) were bred in the animal facility of the Centre d’Immunologie de Marseille-Luminy (Marseille, France). Five- to 8-wk-old mice were used for the experiments. The cDNA encoding the α and β chains of the TCR from P1A-specific CTL clone P1.5 of DBA/2 origin (17) were cloned in a previously established cassette vector (18) kindly provided by C. Benoist (Harvard Medical School, Boston, MA). Two founder mice were generated in a mixed background with proper integration of both TCRα and β chain cDNAs. They were backcrossed for two generations on B10.D2, and further either on B10.D2 or DBA/2 wild-type or RAG-1°/°B10.D2 mice for more than six generations (see Fig. 1⇓). Data presented concern only line 29TCRP1A, hereafter referred to as TCRP1A. Transmission of the transgenes to subsequent generations was ascertained by PCR using a set of primers: Vα8 (5′-GAATTCATGCGTCCTGGCACCTGC-3′) and Jα10 (5′-ACCAGCAATCGAGTCCCACTTCCA-3′), or Vβ1 (5′-GAATTCATGAGCTGCAGGCTTCTC-3′) and Jβ1.2 (5′-AAAAGCCTGGTCCCCGACCGAAG-3′), and by cytofluorimetry on blood lymphocytes using anti-Vα8.3 mAb or H-2Ld tetramers refolded in the presence of the P1A nonameric peptide, LPYLGWLVF (Ld/P1A tetramer), and based on a scaffold of biotin-streptavidin-PE as described (19). Representation of Ld/P1A-specific CD8 T cells in the LN of TCRP1A tg mice. Cells from the LNs of non-tg or tg TCRP1A(B10.D2), TCRP1A(DBA/2), (TCRP1A(B10.D2)xDBA/2)F1, and TCRP1A(RAG-1°/°B10.D2) mice were analyzed by cytofluorimetry. a, CD4 vs CD8 dot plots are shown in the first two columns and CD4:CD8 ratios in the third column (non-tg and tg TCRP1A mice of B10.D2 (gray bars), DBA/2 (open bars), and F1 (striped bars) backgrounds). Values in the bar graphs are means ± SD of four independent experiments. The difference in CD4:CD8 ratios between tg TCRP1A(B10.D2) mice and either non-tg B10.D2 (p < 0.001), tg DBA/2 (p < 0.0001), or tg F1 (p < 0.0001) mice is highly significant. b, Staining with anti-Vα8.3 or with Ld/P1A tetramer is shown within the CD8+ cells. The numbers above the gating bars on the histograms depict percentage of positive cells. One experiment where backcross was N6 for B10.D2, N8 for DBA/2, N4 B10.D2 for the F1, and N8 for RAG-1°/°B10.D2 is shown, which is representative of six experiments performed independently with mice of later backcrosses. Cells were prepared from thymus and lymph nodes (LNs) according to standard procedures. PBL were prepared from heparinized blood using Ficoll-Paque PLUS lymphocyte isolation kit (Amersham Biosciences, Uppsala, Sweden). Splenocyte preparations were depleted of RBCs by 0.83% NH4Cl treatment. Adult B10.D2 or DBA/2 mice were gamma irradiated (10 Gy from a 137Cs source) and reconstituted 1 day later (i.v.) with T-depleted 1 × 107 BM cells from TCRP1A DBA/2 or B10.D2 mice individually “single chimeras” or as a mixture in the ratio B10.D2:DBA/2 = 1:2 or 1:4 for the “double chimeras”. T-depleted BM cells were obtained after treatment with 0.83% NH4Cl followed by an Ab-mediated complement lysis using an anti-Thy1.2 Ab (JIJ). Thymocytes and LN were analyzed by flow cytometry at least 6 wk after reconstitution. Abs used for surface immunofluorescence staining were: FITC-labeled anti-CD4, anti-CD69, anti-CD25, anti-CD44, anti-CD62L, anti-CD24, and anti-CD5.1, PE-labeled anti-CD4 and anti-Vα8.3, PerCP-Cy5.5-labeled anti-CD8α, and APC-labeled anti-CD4, anti-CD8α, anti-CD3, and anti-CD5 (BD PharMingen, San Diego, CA). Triple or quadruple staining was done by incubating 1 × 106 cells with a desired combination of the indicated Abs for 30 min at 4°C. After two washes, cells were fixed in 1% paraformaldehyde and run on a FACSCalibur cytofluorometer (BD Biosciences, Mountain View, CA). Data were analyzed using CellQuest (BD Biosciences) or FlowJo software (Treestar, Ashland, OR). The comparison of mean values between groups was analyzed using GraphPad Prism (GraphPad, San Diego, CA). One-way ANOVA was performed to evaluate the statistical significance of the differences between the test groups. Values of p < 0.05 were considered to be statistically significant. Mice expressing the TCRP1Aα and β cDNAs were obtained in mixed background mice. One founder was backcrossed for two generations on B10.D2 and further either on B10.D2, DBA/2, or RAG-1°/°B10.D2. The distribution of CD4 vs CD8 T cells in the LNs of non-tg mice shows that DBA/2 mice have a higher ratio of CD4 to CD8 T cells in the periphery, as previously reported (20). In the TCRP1A mice on the B10.D2 background, this CD4/CD8 ratio was decreased, as expected when a MHC class I-restricted TCR is expressed as a transgene (21, 22, 23, 24). In contrast, in the DBA/2 background, the CD4/CD8 ratio was even slightly increased in mice expressing the TCRP1A tg (Fig. 1⇑a). Furthermore, the analysis of TCRP1A expressing CD8 T cells by anti-Vα8.3 or Ld/P1A tetramer staining (Fig. 1⇑b) showed that a higher percentage of LN CD8 T cells expressed the αβ TCRP1A chains in the B10.D2 background mice, as compared with the DBA/2 background. Control CD8 T cells from non-tg mice did not bind Ld/P1A tetramer and fewer than 15% expressed Vα8.3 (Fig. 1⇑b). CD4 LN T cells from TCRP1A mice on either B10.D2 or DBA/2 backgrounds failed to bind Ld/P1A tetramers (results not shown). Furthermore, when we crossed tg mice with RAG-1°/°B10.D2 mice, which do not have endogenous TCR αβ chains, LNs from such mice contained only CD8 T cells, 95% of which expressed the Ld/P1A binding TCR (Fig. 1⇑b). These results are consistent with an exclusive selection on the CD8 lineage for the TCRP1A. Analysis of surface markers on the TCRP1A-positive LN CD8 T cells indicates that they are naive (absence of CD44, CD69, and CD25, and presence of CD62L; results not shown) in both B10.D2 or DBA/2 mice. Altogether, both the proportion of CD8 T cells and the representation of a particular class I-restricted TCR, TCRP1A, were defective in DBA/2 as compared with B10.D2 mice. The same observation was made when PBLs or splenic populations were studied (results not shown). Examination of F1 mice (litter from mice after four backcross generations on B10.D2 crossed with DBA/2 mice; Fig. 1⇑, a and b) showed an intermediate phenotype suggesting that no dominant negative effect of DBA/2 genes was involved. To understand what factors may lead to the poor representation of this tumor Ag-specific TCR in the strain in which it was originally selected, we next analyzed thymocyte subpopulations. Thymic cellularity in TCRP1A mice was similar on B10.D2 or DBA/2 backgrounds, and consistently higher than that in non-tg control mice (Fig. 2⇓a). CD8 vs CD4 dot plots showed a relative enrichment in CD8 SP over CD4 SP thymocytes in TCRP1A B10.D2 mice as compared with non-tg B10.D2 littermates (2.8-fold in the experiment shown in Fig. 2⇓a; 3.4-fold for the mean values shown in Table I⇓). In absolute cell numbers, there was about a 5.5-fold increase (for the mean values shown in Table I⇓; 3.5-fold for the experiment shown in Fig. 2⇓a) in CD8 SP thymocytes in TCRP1A tg as compared with non-tg B10.D2 littermates. On the DBA/2 background, such increase in the number of CD8 SP thymocytes in TCRP1A mice as compared with non-tg mice was much less pronounced (1.65-fold for the mean values shown in Table I⇓; 1.01-fold for the experiment shown in Fig. 2⇓a). The number of CD8 SP thymocytes for the F1 mice was intermediate between that of the two parental TCRP1A strains, and all of the TCRP1A mice had a similar number of CD4 SP thymocytes (Table I⇓). 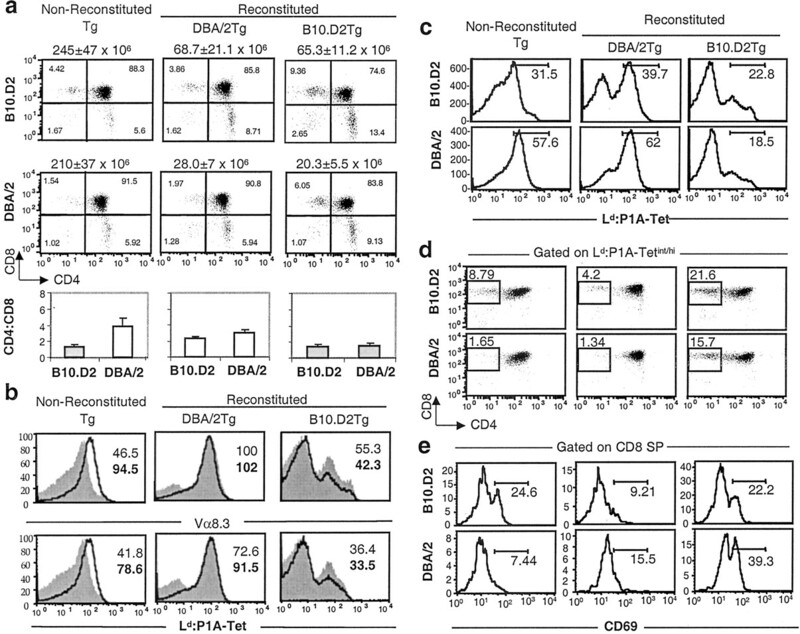 Non-MHC genes influence selection of Ld/P1A-specific CD8 SP thymocytes. Thymocytes from different TCRP1A tg mice and non-tg littermates were analyzed by cytofluorimetry. a, CD4 vs CD8 dot plots are shown in the first two columns with the percentage of cells indicated in each quadrant for individual mice. Numbers above the dot plots indicate total thymocytes/mouse as means ± SD of three independent experiments using 5- to 6-wk-old age-matched mice. Ratios of CD4 SP to CD8 SP thymocytes (CD4:CD8) from the same three experiments are shown in the third column as means ± SD. Bar codes are as in Fig. 1⇑a. The differences in CD4:CD8 ratios between tg B10.D2 and tg DBA/2 (p < 0.001) or tg F1 (p < 0.01) mice are significant. b, Vα8.3 and Ld/P1A-tet stainings are shown in gated tg TCRP1A CD8 SP, DP, and CD4 SP thymocyte subpopulations. Filled gray curves with mean fluorescence intensity (MFI) numbers in normal font represent tg TCRP1A B10.D2 and bold curves with MFI shown by bold numbers represent tg TCRP1A DBA/2 strains. c, Ld/P1A-tetramer staining is shown on total thymocytes from non-tg or tg TCRP1A mice. Numbers in parentheses in the histograms show MFI of total cells. In the second histogram, gates have been set for Ld/P1A-tetlow, Ld/P1A-tetint/high, and Ld/P1A-tethigh staining, which have been used to plot CD4 vs CD8 dot plots, respectively, in d. e, CD4 vs CD8 distribution dot plots are shown for tg TCRP1A thymocytes gated on the Ld/P1A-tetint/high population. Percentage of CD69-positive thymocytes is indicated under the gated CD8 SP, CD8+CD4low, and DP subpopulations (from left to right). One experiment representative of three independent experiments is shown, a–d being part of one, and e part of another experiment. To further analyze the pattern of expression of the Ld/P1A-binding TCR on transitional thymocyte subpopulations, thymocytes with different levels of Ld/P1A staining were analyzed for CD4 vs CD8 expression (Fig. 2⇑c). Gating on the “low Ld/P1A-binding” thymocytes (first dot plot in Fig. 2⇑d) revealed that they were mostly DP with a small proportion of CD4+CD8− thymocytes in both mouse strains. The latter having the phenotype of CD4 SP thymocytes probably correspond to a contamination of that fraction by “very low to negative” Ld/P1A-binding cells. The adjacent population of “intermediate (int)/high Ld/P1A-binding” thymocytes (second dot plot in Fig. 2⇑d) contained DP thymocytes in both strains with a significant proportion of CD8 SP thymocytes only in B10.D2 mice. When gating was on high Ld/P1A-binding thymocytes (third dot plot in Fig. 2⇑d), the proportion of CD8 SP thymocytes increased to 12% in B10.D2, whereas it remained low (1.4%) in DBA/2 mice, where most of the “high Ld/P1A-binding” thymocytes were DP. To evaluate the proportion of Ld/P1A-binding thymocytes that were in a process of TCR-mediated selection, we monitored surface expression of CD69 since this marker has been found to be up-regulated on both “positively” and “negatively” selected thymocytes (25). As shown in Fig. 2⇑e, CD69 was expressed on a higher proportion of Ld/P1Aint/high thymocytes in B10.D2 as compared with DBA/2 mice. This was true for all thymocyte subpopulations tested (CD8 SP, CD8+ CD4low, and DP). Because the expression of the tg TCRα chain and staining with Ld/P1A do not necessarily reveal total level of TCR/CD3 (if endogenous TCRα chains are expressed), we further analyzed the level of CD3 on thymocyte subpopulations in TCRP1A tg B10.D2 and DBA/2 mice. Data showed that the level of CD3 was consistently lower on the B10.D2 as compared with DBA/2 DP thymocytes (data not shown). As with Ld/P1A staining, both CD3int and CD3high thymocytes were characterized by a lower ratio of CD8 SP to DP thymocytes in DBA/2 as compared with B10.D2 mice (data not shown). Furthermore, CD3 vs Ld/P1A-tet binding plots showed a diagonal distribution on DP thymocytes for both TCRP1A tg mouse strains (data not shown), and failed to detect CD3high Ld/P1Alow thymocytes, which would identify thymocytes with endogenous TCRα expression, preferentially in one of the tg strains. Altogether, these results suggest that in DBA/2 mice, the TCRP1A/CD3 is expressed at a high level on DP thymocytes, but that the selection process is inefficient in that strain. Although the TCRP1A (N4.B10.D2 × DBA/2)F1 presented an “intermediate” phenotype (data not shown), this mouse presents a mixed genetic make up in both hemopoietic and stromal cells and it is not clear which component provides the partial correction of the phenotype. To distinguish whether the poor selection observed in the DBA/2 strain was to be attributed to stromal thymic components or was intrinsic to cells of hemopoietic origin, a series of BM radiation chimeras was analyzed. Four types of chimeras were made by transfer of T cell-depleted BM from TCRP1A (DBA/2) or TCRP1A (B10.D2) mice in either DBA/2 or B10.D2 lethally irradiated recipient mice. Analysis of CD4 vs CD8 expression on thymocytes indicates that TCRP1A (B10.D2) BM precursors generate a lower CD4/CD8 SP thymocyte ratio than TCRP1A (DBA/2) BM precursors whether they differentiate in B10.D2 or in DBA/2 hosts (Fig. 3⇓a). 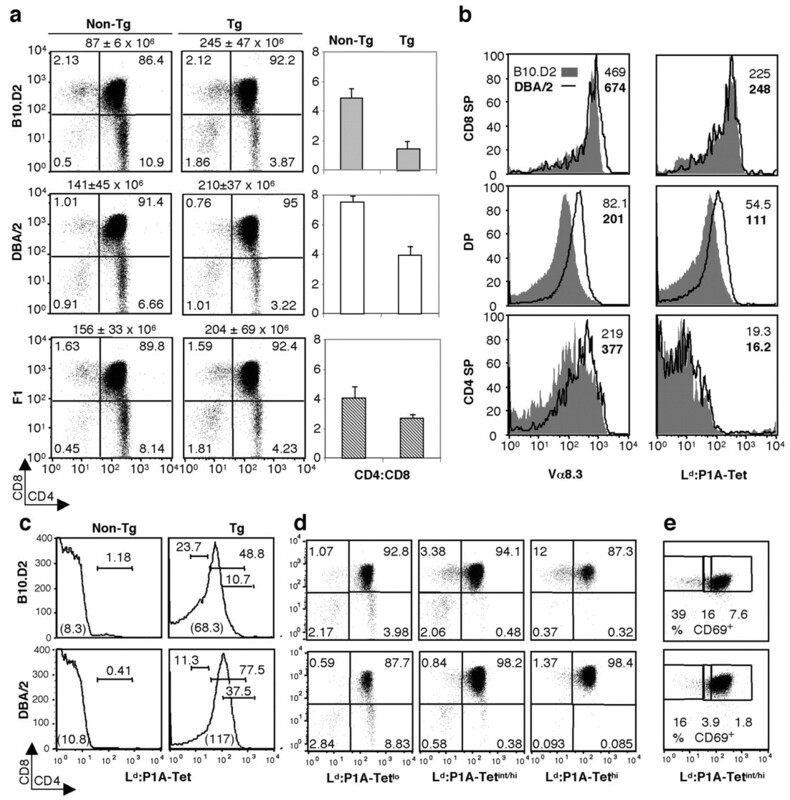 Differential expression of TCRP1A on DP thymocytes and frequency at which TCRP1A-expressing thymocytes are selected in the CD8 SP lineage in B10.D2 and DBA/2 backgrounds is independent of the thymic stromal cells. Thymocytes from B10.D2 and DBA/2 TCRP1A tg mice (nonreconstituted) or from B10.D2 and DBA/2 radiation chimeras reconstituted with BM from DBA/2 or B10.D2 TCRP1A tg donors were analyzed by cytofluorimetry. a, CD4 vs CD8 dot plots are shown for B10.D2 (first row) or DBA/2 (second row) hosts that received BM from tg TCRP1A DBA/2 (second column) or tg TCRP1A B10.D2 (third column) origin. CD4:CD8 ratios for SP thymocytes are shown as gray bars for tg B10.D2 or for chimeras with BM of tg B10.D2 origin, as white bars for tg DBA/2 or for chimeras with BM of tg DBA/2 origin. Hosts were B10.D2 or DBA/2 as indicated under the bars. Numbers above the dot plots indicate total thymocytes/mouse. Values are means ± SD of three independent experiments. The differences in CD4:CD8 ratios between tg TCRP1A(B10.D2) and tg DBA/2 mice (p < 0.0001) or between chimeras with BM from tg B10.D2 and chimeras with BM from tg DBA/2 (p < 0.01) mice are significant, whereas those between chimeras reconstituted with the same tg BM in two distinct hosts are not. b, Vα8.3 (first row) and Ld/P1A-tet (second row) staining levels are shown within the gated DP thymocyte subpopulations. Filled gray curves for B10.D2 and bold empty curves for DBA/2 correspond to the source of the thymocytes in the nonreconsituted samples, while in the reconstituted samples, they correspond to host chimeras. C, Ld/P1A-tetramer staining levels are shown on total thymocytes and the percentage of Ld/P1A-tetint/high cells is reported. d, Dot plots show CD4 vs CD8 distribution within the cells gated for Ld/P1A-tetint/high staining in c. Numbers in the dot plots show percentage of CD8 SP thymocytes. e, CD69 staining levels and percentage of CD69+ cells are shown within the cells gated as CD8 SP thymocytes in d. One experiment representative of four independent experiments is shown. As no differences appeared at the DN checkpoint (results not shown), we further analyzed DP, SP, and transition populations with respect to expression of TCRP1A and Vα8.3 to assess whether the genetic make up of the thymic stromal cells might affect any thymocyte differentiation or commitment pattern. The higher level of expression of Vα8.3 and Ld/P1A-binding TCR on DP thymocytes was characteristic of the origin of the TCRP1A tg BM, being high for BM of DBA/2 origin (Fig. 3⇑b, second panel) and low for BM of B10.D2 origin (Fig. 3⇑b, third panel). In radiation chimeras reconstituted with DBA/2 TCRP1A tg BM, the proportion of total thymocytes expressing TCRP1A is also higher than in the chimeras reconstituted with B10.D2 tg BM, whether hosts are B10.D2 or DBA/2 (Fig. 3⇑c). Furthermore, gating on the Ld/P1A-binding population (Ld/P1Atetint/high in Fig. 3⇑d) shows that the proportion of CD8 SP thymocytes in that population is also characteristic of the source of tg BM, being higher with B10.D2 BM. A correspondingly lower proportion of CD69-positive CD8 SP thymocytes is also characteristic of the DBA/2 origin of hemopoietic cells (Fig. 3⇑e). 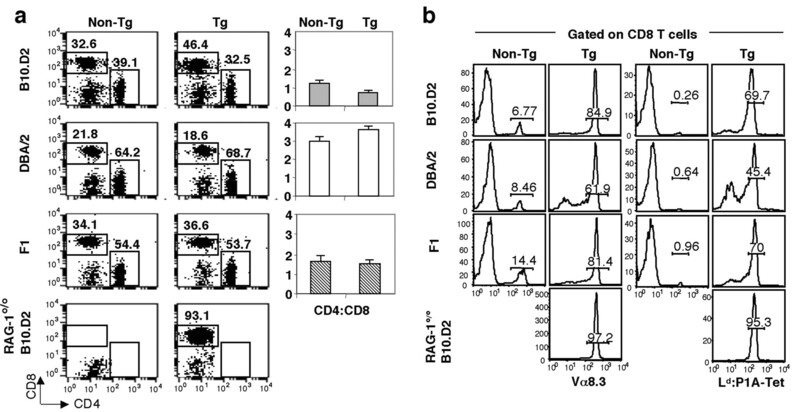 These results suggest that the frequency at which TCRP1A-expressing DP thymocytes are committed or selected in the CD8 SP lineage is differentially controlled in B10.D2 and DBA/2 backgrounds, irrespective of the source of thymic stromal cells. To further evaluate whether these characteristics of TCRP1A expression are truly thymocyte-intrinsic, or may be influenced by other hemopoietic thymic cells, we established an additional series of radiation chimeras reconstituted with a mixture of TCRP1A BM cells of B10.D2 and DBA/2 origin. A next series of radiation chimeras was constructed in which irradiated B10.D2 hosts were reconstituted with T cell-depleted BM from TCRP1A tg mice of either B10.D2 or DBA/2 background (single chimeras), or with a mixture of these two (double chimeras with a ratio of B10.D2 to DBA/2 tgBM of 1:2 or 1:4). The CD5 allele difference between B10.D2 (CD5.2) and DBA/2 (CD5.1) allowed for a separate analysis of the thymocytes of each origin. As expected, in the single chimeras reconstituted with T cell-depleted DBA/2 tg BM, >95% of the thymocytes were stained with the anti-CD5.1 mAb, whereas in the double chimeras 69 and 79% of thymocytes were stained with this Ab when the mixture of B10.D2 to DBA/2 BM was of 1:2, or 1:4, respectively (results not shown). The observation that reconstitution of the “double” chimeras is in favor of the BM of DBA/2 origin may be related to the described higher frequency of hemopoietic stem cells within the BM (26) and higher capacity for self renewal of hemopoietic cells (27) in DBA/2 as compared with C57BL/6 mice. Profiles of Ld/P1A tetramer binding are shown on the gated CD5.1-positive and/or -negative thymocytes from each sample (Fig. 4⇓a). As previously shown (Fig. 3⇑c), the fraction of Ld/P1A tetramer staining thymocytes was higher in DBA/2 TCRP1A mice as well as in “single” chimeras reconstituted with DBA/2 tg BM, than for the corresponding B10.D2. In double chimeras, however, the proportion of Ld/P1A tetramer-positive cells was similar, or higher in the CD5.1-negative cells as compared with the CD5.1-positive thymocytes (Fig. 4⇓a). When gating on the Ld/P1A tetramer int/high subpopulations as indicated in the figure, CD8 vs CD4 dot plots (Fig. 4⇓a, lower panel) showed a consistently lower proportion of CD8 SP thymocytes on CD5.1-positive cells originating from tg DBA/2 BM, than on the corresponding CD5.1-negative population originating from tg B10.D2 BM. Similar results were obtained after gating on CD3high thymocytes, where CD4 to CD8 ratios were higher in CD5.1-positive thymocytes (Fig. 4⇓b). The fraction of CD8 SP to DP thymocytes within the CD3high populations was also characteristically lower in the CD5.1-positive populations (Fig. 4⇓b). Differential selection of Ld/P1A-specific thymocytes is controlled by the genetic makeup of the differentiating thymocytes. Thymocytes from B10.D2 and DBA/2 TCRP1A tg mice or from B10.D2 radiation chimeras reconstituted with BM from B10.D2 or DBA/2 TCRP1A tg mice as “single chimeras” or with a mixture (ratio of 1:2 or 1:4 as indicated) of BM from B10.D2 and DBA/2 TCRP1A tg mice as “double chimeras” were stained with anti-CD5.1 and analyzed by cytofluorimetry. Ld/P1A-tet (a) and anti-CD3 (b) staining is shown (first row) within the CD5.1 minus (B10.D2 origin) and CD5.1 plus (DBA/2 origin) thymocyte subpopulations. CD4 vs CD8 distribution dot plots are shown (second row) within the cells gated for Ld/P1A-tetint/high (a) and CD3high (b) staining in the first row. Numbers in the histograms or dot plots represent percentage of cells within the respective gates. One experiment representative of two independent experiments is shown. It can be noted that the fraction of CD8 SP to DP thymocytes within the CD3high populations was characteristically lower in the CD5.1-positive populations (0.63, 1.16, 1.2, and 0.9) as compared with the CD5.1-negative populations (2.43, 2.18, 2.28, and 3.3) whether nonreconstituted TCRP1A, “single chimeras,” or “double chimeras” were considered, respectively. These results indicate that the characteristic higher frequency at which TCRP1A-expressing DP thymocytes are committed or selected in the CD8 SP lineage in the B10.D2 as compared with the DBA/2 background is intrinsically controlled by the genetic make up of the differentiating thymocytes. Additional complexity in the pattern of thymocyte differentiation/selection may arise from variations in the thymic environment (28) that may include the presence of immature thymocytes with distinct differentiation potential as observed in the double chimeras (Ref. 28 and our results; see Discussion). T cell representation in the periphery is dependent on thymic differentiation/selection events as well as on factors controlling their exit from the thymus and their peripheral expansion/survival. The latter events may be influenced by the genetic make up of the environment, in particular, the dendritic cell component independent of the thymus. To evaluate this possibility, we analyzed the peripheral T cells in the single and double radiation chimeras constructed in irradiated B10.D2 hosts after gating (as described earlier) (Fig. 4⇑) on CD5.1-positive and/or CD5.1-negative LN cells (Fig. 5⇓). T cell lineage-intrinsic control of the representation of CD8 T cells expressing Ld/P1A-specific TCR in the peripheral organs. Cells from the LNs of B10.D2 and DBA/2 TCRP1A tg mice or from B10.D2 radiation chimeras reconstituted with TCRP1A tg BM as “single” or “double chimeras” (see Fig. 4⇑) were stained with anti-CD5.1 and analyzed by cytofluorimetry. CD4:CD8 ratios are shown (first row) within the CD5.1 minus (B10.D2 origin, gray bars) and CD5.1 plus (DBA/2 origin, open bars) subpopulations. Values in the bar graphs are means ± SD of two independent experiments. CD4:CD8 ratios for tg B10.D2 mice and for single or double chimeras within the CD5.1 minus subpopulation are significantly different from those in tg DBA/2 mice (p < 0.0001) and in the corresponding CD5.1 plus subpopulation (p < 0.01), respectively. In the second row, Ld/P1A tetramer staining and percentage of positive cells are shown on CD8+ cells present within the CD5.1− and CD5.1+ subpopulations as indicated. One experiment representative of two independent experiments is shown. In B10.D2 hosts reconstituted with tg TCRP1A(B10.D2) BM, the low LN CD4/CD8 ratio characteristic of B10.D2 was observed, whereas reconstitution with tg TCRP1A(DBA/2) led to a high ratio characteristic of DBA/2 (Fig. 5⇑a). In the double chimeras, the CD4/CD8 cell ratios were higher for CD5.1-positive T cells of DBA/2 origin than for CD5.1-negative T cells of B10.D2 origin (Fig. 5⇑b). 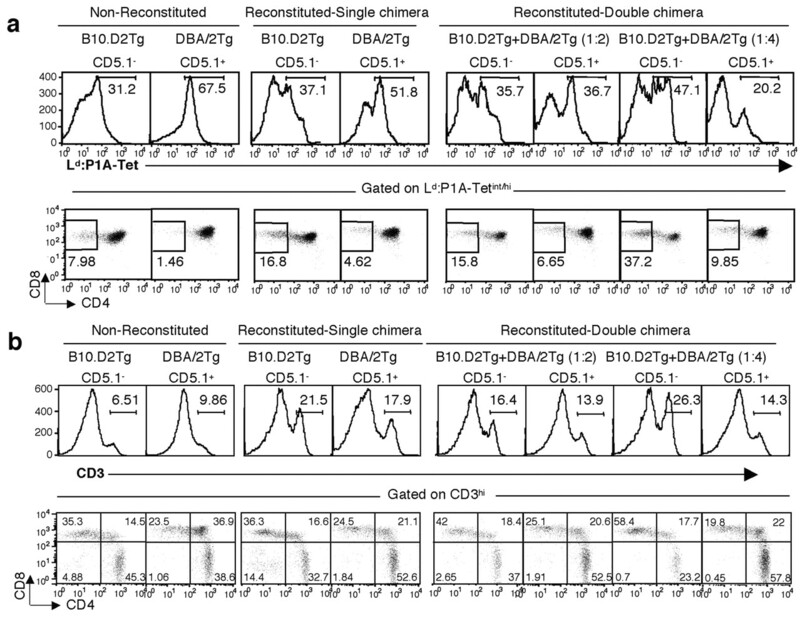 The fraction of CD8 T cells that binds Ld/P1A tetramer was also consistently lower when T cells were of DBA/2 origin whether in single or double chimeras (Fig. 5⇑, a and b). The characteristics of inferior CD8 T-lineage selection/commitment in tg TCRP1A mice of DBA/2 as compared with B10.D2 background that are imprinted in a thymocyte autonomous fashion during thymic development are also found in the peripheral T cell population. It can be noted, however, that there may be a thymus-independent regulation of the relative expansion/homeostasis of peripheral T cells of DBA/2 vs B10.D2 origin in the irradiated host since for double chimeras composed of 69 and 79% thymocytes of DBA/2 origin, only ∼44% of peripheral T cells were of DBA/2 origin (results not shown). Expression of a MHC class I-restricted TCR as a transgene in the thymus generally increases the frequency of CD8 vs CD4 lineage thymocytes so that the ratio of CD4 to CD8 lineage T cells in thymus and periphery, usually in favor of CD4, becomes reversed (21, 22, 23). In this study, we analyzed a model in which the TCRP1A was expressed under control of regulatory sequences of the TCRβ and TCRα, respectively (18). The TCRP1A was clearly selected exclusively on the CD8 lineage as indicated in the Rag-1°/° mice, as well as by the high and homogeneous expression of the tg TCRα chain on CD8 T cells as compared with its low and heterogeneous expression on the CD4 T cells. The poor representation of peripheral CD8 T cells expressing tg TCRP1A in DBA/2 mice led us to evaluate whether the thymic environment could affect selection of this TCR. In particular, in addition to its expression in MHC class I-negative gametogenic tissue (29), P1A mRNA was recently detected in some medullary thymic epithelial cells thought to contribute to tolerance induction to tissue Ags (30). Our results show that the improved selection of TCRP1A-expressing CD8 T cells in mice of the B10.D2 strain is genetically controlled in a thymocyte-intrinsic fashion, independent of the genetic make up of the thymic stroma or of non-T lineage hemopoietic cells, ruling out a role for thymic epithelium or hemopoietic and antigenic environment in preventing positive selection or inducing negative selection. Indeed, a striking difference appeared in the expression pattern of the tg TCRP1A on DP thymocytes, depending on the genetic background. As CD3 expression followed a similar pattern as that of the TCRP1A, differences in expression of endogenous TCRα chains should not be responsible for this strain-dependent phenotype. In DBA/2, a homogenous TCRP1Aint DP thymocyte population led to poor selection to the CD8 lineage, whereas in B10.D2, a reduced fraction of DP thymocytes expressed the TCRP1A and at lower level, yet selection to the CD8 lineage occurred more frequently in that strain. This characteristic appears to be mostly thymocyte-intrinsic as in radiation BM chimeras, the percentage of TCRP1Ahigh cells that are CD8 SP is higher when thymocytes are of B10.D2 origin in either B10.D2 (22%) or DBA/2 (16%) hosts, than of DBA/2 origin in either B10.D2 (4%) or DBA/2 (1.3%) hosts. However, as the homologous combinations show the most extreme differences, there may be a minor component associated with the thymic context. Thus, TCRint expression on a majority of DP thymocytes, in DBA/2 mice, does not appear appropriate for maturation to the CD8 lineage. Two main interpretations may be put forward: 1) DP TCRint thymocytes may represent “CD4-committed” thymocytes for which coengagement of TCR and CD8 does not provide the appropriate signal (in strength and duration (1, 2)) required for their differentiation; and 2) in DBA/2 mice, DP thymocytes may have an “intrinsic” property that endows low probability of selection to the CD8 lineage. This probability would not be increased by expression of a MHC class I-restricted TCR even in an appropriately selecting environment. The latter proposition would be compatible with the higher ratio of CD4 to CD8 thymocytes in DBA/2 mice as compared with “C57BL/6-based” mice, independent of the expression of a tg TCR (Ref. 20 , our data, Fig. 2⇑a). The relative size of the CD4 and CD8 T cell compartments is known to be genetically controlled in mice and man (20, 31, 32). In some mouse combinations, this trait was mapped to the TCRα chain locus, suggesting that it was the consequence of a preference for MHC class II selection by a given array of Vα genes characterizing a TCRα haplotype (33). However, the higher CD4/CD8 T cell ratio in DBA/2 as compared with C57BL/6 mice was not linked to either TCRα or TCRβ loci, and was independent of MHC haplotype (20). It was suggested to originate in the thymus and to be controlled by thymocyte-intrinsic factors (20), although linkage analysis also suggests that additional genes may influence CD4/CD8 T cell ratio in the periphery vs the thymus (34). Candidates for genes controlling the CD4/CD8 lineage decision include lck (strength of signal) (35), as well as the transcription factor GATA-3 and its antagonist ROG (10). The activity of the src kinase, Lck, directly controls the strength of signal resulting from TCR/coreceptor engagement, whereas the level of GATA-3 expression depends on the strength of TCR-mediated signaling and regulates CD4/CD8 differentiation. Thus, overexpression of GATA-3 in DP thymocytes inhibits differentiation of CD8 SP thymocytes, whereas expression of its antagonist ROG enhances the development of CD8 SP thymocytes (10). It is interesting to note that ROG also represses IL-4 gene activation in CD8 T cells (36). Thus, a genetic background in which ROG functions more efficiently may be expected to develop more frequent CD8 lineage T cells and to be more “Th1” prone as is the case for C57BL/6-based mice (20, 37). Other transcription factors (9, 38) or transcriptional repressors (11, 39) also influence CD4/CD8 lineage decision. As most studies that carefully analyzed pathways of thymocyte selection (21, 22, 24, 40) and lineage commitment (5, 41, 42) were based on the C57BL/6 genetic background, it will be important to determine how polymorphism in thymocyte-intrinsic genes may affect these processes and which molecules are involved. Genome-tagged mice recently developed with DBA/2 as a donor and C57BL/6 as a background strain (43) may be useful for such an approach. The comparison of gene expression in the defined DP thymocyte populations expressing a tg TCR that is selectable for the CD8-lineage but whose actual selection frequency varies depending on the strain of origin as defined in our study, may be informative in this regard. Analysis of the chromatin structure (44, 45) of the CD4 and CD8 loci in these populations may also reveal whether low frequency of transit of DP thymocytes to the CD8 lineage characterizes a population of DP thymocyte that may be “precommitted” to the CD4 lineage. In addition to thymocyte-intrinsic genes and to the well established role of the thymic stroma in TCR-dependent selection of DP thymocytes developing thymocytes were also found to be “aware” of their neighbor thymocytes, as the frequency of differentiation of DP thymocytes to a mature lineage was influenced by the presence of “non-selectable” DP thymocytes (28). The differences in patterns of thymic reconstitution observed in radiation chimeras reconstituted with a homogenous source of tg TCR BM (single chimeras) or with tg TCR BM from two distinct mouse strains (double chimeras) also suggest an additional complexity related to the presence of neighboring thymocytes that would require further study. Additionally, the difference in the relative efficiency of reconstitution of thymocytes and peripheral T cells in those double chimeras further indicates that distinct control mechanisms are involved in postthymic expansion/migration of mature T cells and contribute to the establishment of the useful T cell repertoire. The poor representation of the TCRP1A CD8 T cells in DBA/2 as compared with (DBA/2 × B10.D2)F1 mice (Fig. 1⇑a) was correlated with a lower resistance to growth of P1A-expressing tumors (results not shown). Whether differences in the efficacy of CD8 T cell selection also contribute to the higher susceptibility of DBA/2 as compared with C57BL/6-based mice in other transplanted tumor models (46) remains to be addressed. We thank Else-Marit Inderberg-Suso for efficient mouse screening, Hervé Sanchez for animal care, Corinne Béziers-Guigue for help with artwork, and our colleagues Annick Guimezanes, Lee Leserman, and Philippe Naquet, for criticism on the manuscript. ↵1 This work was supported by institutional grants from Institut National de la Santé et de la Recherche Médicale and Centre National de la Recherche Scientifique, and by grants from Association pour la Recherche sur le Cancer and the European Community (QLG1-1999-00622). ↵2 Current address: GlaxoSmithKline Biologicals, 89 Rue de l’Institut, 1330 Rixensart, Belgium. ↵4 Abbreviations used in this paper: DP, double-positive; SP, single-positive; tg, transgenic; TCRP1A, Ld/P1A-specific TCR transgene; ROG, antagonist of the transcription factor GATA-3; int, intermediate; BM, bone marrow; LN, lymph node; MFI, mean fluorescence intensity. Germain, R. N.. 2002. T-cell development and the CD4-CD8 lineage decision. Nat. Rev. Immunol. 2:309. Singer, A.. 2002. New perspectives on a developmental dilemma: the kinetic signaling model and the importance of signal duration for the CD4/CD8 lineage decision. Curr. Opin. Immunol. 14:207. Keefe, R., V. Dave, D. Allman, D. Wiest, D. J. Kappes. 1999. Regulation of lineage commitment distinct from positive selection. Science 286:1149. MacDonald, H. R., W. Held. 2001. CD8+ T cell development: CD4 to the rescue. Nat. Immunol. 2:1091. Yasutomo, K., C. Doyle, L. Miele, C. Fuchs, R. N. Germain. 2000. The duration of antigen receptor signalling determines CD4+ versus CD8+ T-cell lineage fate. Nature 404:506. Jimenez, E., A. Vicente, R. Sacedon, J. J. Munoz, G. Weinmaster, A. G. Zapata, A. Varas. 2001. Distinct mechanisms contribute to generate and change the CD4:CD8 cell ratio during thymus development: a role for the Notch ligand, Jagged1. J. Immunol. 166:5898. Robey, E., D. Chang, A. Itano, D. Cado, H. Alexander, D. Lans, G. Weinmaster, P. Salmon. 1996. An activated form of Notch influences the choice between CD4 and CD8 T cell lineages. Cell 87:483. Valdez, P., E. Robey. 1999. Notch and the CD4 versus CD8 lineage decision. Cold Spring Harbor Symp. Quant. Biol. 64:27. Wilkinson, B., J. Y. Chen, P. Han, K. M. Rufner, O. D. Goularte, J. Kaye. 2002. TOX: an HMG box protein implicated in the regulation of thymocyte selection. Nat. Immunol. 3:272. Hernandez-Hoyos, G., M. K. Anderson, C. Wang, E. V. Rothenberg, J. Alberola-Ila. 2003. GATA-3 expression is controlled by TCR signals and regulates CD4/CD8 differentiation. Immunity 19:83. Yucel, R., H. Karsunky, L. Klein-Hitpass, T. Moroy. 2003. The transcriptional repressor Gfi1 affects development of early, uncommitted c-Kit+ T cell progenitors and CD4/CD8 lineage decision in the thymus. J. Exp. Med. 197:831. Bain, G., M. W. Quong, R. S. Soloff, S. M. Hedrick, C. Murre. 1999. Thymocyte maturation is regulated by the activity of the helix-loop-helix protein, E47. J. Exp. Med. 190:1605. Van Der Bruggen, P., Y. Zhang, P. Chaux, V. Stroobant, C. Panichelli, E. S. Schultz, J. Chapiro, B. J. Van Den Eynde, F. Brasseur, T. Boon. 2002. Tumor-specific shared antigenic peptides recognized by human T cells. Immunol. Rev. 188:51. Scanlan, M. J., A. O. Gure, A. A. Jungbluth, L. J. Old, Y. T. Chen. 2002. Cancer/testis antigens: an expanding family of targets for cancer immunotherapy. Immunol. Rev. 188:22. Lethe, B., B. van den Eynde, A. van Pel, G. Corradin, T. Boon. 1992. Mouse tumor rejection antigens P815A and P815B: two epitopes carried by a single peptide. Eur. J. Immunol. 22:2283. Brandle, D., J. Bilsborough, T. Rulicke, C. Uyttenhove, T. Boon, B. J. Van den Eynde. 1998. The shared tumor-specific antigen encoded by mouse gene P1A is a target not only for cytolytic T lymphocytes but also for tumor rejection. Eur. J. Immunol. 28:4010. Van den Eynde, B., H. Mazarguil, B. Lethe, F. Laval, J. E. Gairin. 1994. Localization of two cytotoxic T lymphocyte epitopes and three anchoring residues on a single nonameric peptide that binds to H-2Ld and is recognized by cytotoxic T lymphocytes against mouse tumor P815. Eur. J. Immunol. 24:2740. Kouskoff, V., K. Signorelli, C. Benoist, D. Mathis. 1995. Cassette vectors directing expression of T cell receptor genes in transgenic mice. J. Immunol. Methods 180:273. Murali-Krishna, K., J. D. Altman, M. Suresh, D. J. Sourdive, A. J. Zajac, J. D. Miller, J. Slansky, R. Ahmed. 1998. Counting antigen-specific CD8 T cells: a reevaluation of bystander activation during viral infection. Immunity 8:177.
van Meerwijk, J. P., T. Bianchi, S. Marguerat, H. R. MacDonald. 1998. Thymic lineage commitment rather than selection causes genetic variations in size of CD4 and CD8 compartments. J. Immunol. 160:3649. Pircher, H., K. Burki, R. Lang, H. Hengartner, R. M. Zinkernagel. 1989. Tolerance induction in double specific T-cell receptor transgenic mice varies with antigen. Nature 342:559. Schonrich, G., U. Kalinke, F. Momburg, M. Malissen, A. M. Schmitt-Verhulst, B. Malissen, G. J. Hammerling, B. Arnold. 1991. Down-regulation of T cell receptors on self-reactive T cells as a novel mechanism for extrathymic tolerance induction. Cell 65:293. Sha, W. C., C. A. Nelson, R. D. Newberry, D. M. Kranz, J. H. Russell, D. Y. Loh. 1988. Positive and negative selection of an antigen receptor on T cells in transgenic mice. Nature 336:73. Lucas, B., R. N. Germain. 1996. Unexpectedly complex regulation of CD4/CD8 coreceptor expression supports a revised model for CD4+CD8+ thymocyte differentiation. Immunity 5:461. Muller-Sieburg, C. E., R. H. Cho, H. B. Sieburg, S. Kupriyanov, R. Riblet. 2000. Genetic control of hematopoietic stem cell frequency in mice is mostly cell autonomous. Blood 95:2446.
de Haan, G., L. V. Bystrykh, E. Weersing, B. Dontje, H. Geiger, N. Ivanova, I. R. Lemischka, E. Vellenga, G. Van Zant. 2002. A genetic and genomic analysis identifies a cluster of genes associated with hematopoietic cell turnover. Blood 100:2056. Canelles, M., M. L. Park, O. M. Schwartz, B. J. Fowlkes. 2003. The influence of the thymic environment on the CD4-versus-CD8 T lineage decision. Nat. Immunol. 4:756. Uyttenhove, C., C. Godfraind, B. Lethe, A. Amar-Costesec, J. C. Renauld, T. F. Gajewski, M. T. Duffour, G. Warnier, T. Boon, B. J. Van den Eynde. 1997. The expression of mouse gene P1A in testis does not prevent safe induction of cytolytic T cells against a P1A-encoded tumor antigen. Int. J. Cancer 70:349. Derbinski, J., A. Schulte, B. Kyewski, L. Klein. 2001. Promiscuous gene expression in medullary thymic epithelial cells mirrors the peripheral self. Nat. Immunol. 2:1032. Amadori, A., R. Zamarchi, G. De Silvestro, G. Forza, G. Cavatton, G. A. Danieli, M. Clementi, L. Chieco-Bianchi. 1995. Genetic control of the CD4/CD8 T-cell ratio in humans. Nat. Med. 1:1279. Kraal, G., I. L. Weissman, E. C. Butcher. 1983. Genetic control of T-cell subset representation in inbred mice. Immunogenetics 18:585. Sim, B. C., N. Aftahi, C. Reilly, B. Bogen, R. H. Schwartz, N. R. Gascoigne, D. Lo. 1998. Thymic skewing of the CD4/CD8 ratio maps with the T-cell receptor α-chain locus. Curr. Biol. 8:701. Myrick, C., R. DiGuisto, J. DeWolfe, E. Bowen, J. Kappler, P. Marrack, E. K. Wakeland. 2002. Linkage analysis of variations in CD4:CD8 T cell subsets between C57BL/6 and DBA/2. Genes Immun. 3:144. Hernandez-Hoyos, G., S. J. Sohn, E. V. Rothenberg, J. Alberola-Ila. 2000. Lck activity controls CD4/CD8 T cell lineage commitment. Immunity 12:313. Omori, M., M. Yamashita, M. Inami, M. Ukai-Tadenuma, M. Kimura, Y. Nigo, H. Hosokawa, A. Hasegawa, M. Taniguchi, T. Nakayama. 2003. CD8 T cell-specific down-regulation of histone hyperacetylation and gene activation of the IL-4 gene locus by ROG, repressor of GATA. Immunity 19:281. Butler, N. S., M. M. Monick, T. O. Yarovinsky, L. S. Powers, G. W. Hunninghake. 2002. Altered IL-4 mRNA stability correlates with Th1 and Th2 bias and susceptibility to hypersensitivity pneumonitis in two inbred strains of mice. J. Immunol. 169:3700. Hayashi, K., N. Abe, T. Watanabe, M. Obinata, M. Ito, T. Sato, S. Habu, M. Satake. 2001. Overexpression of AML1 transcription factor drives thymocytes into the CD8 single-positive lineage. J. Immunol. 167:4957. Taniuchi, I., M. Osato, T. Egawa, M. J. Sunshine, S. C. Bae, T. Komori, Y. Ito, D. R. Littman. 2002. Differential requirements for Runx proteins in CD4 repression and epigenetic silencing during T lymphocyte development. Cell 111:621. Swat, W., M. Dessing, H. von Boehmer, P. Kisielow. 1993. CD69 expression during selection and maturation of CD4+8+ thymocytes. Eur. J. Immunol. 23:739. Bosselut, R., L. Feigenbaum, S. O. Sharrow, A. Singer. 2001. Strength of signaling by CD4 and CD8 coreceptor tails determines the number but not the lineage direction of positively selected thymocytes. Immunity 14:483. Lucas, B., G. Marodon, C. Penit. 1996. CD4low TCRint thymocytes do not belong to the CD8 lineage maturation pathway. J. Immunol. 156:1743. Iakoubova, O. A., C. L. Olsson, K. M. Dains, D. A. Ross, A. Andalibi, K. Lau, J. Choi, I. Kalcheva, M. Cunanan, J. Louie, et al 2001. Genome-tagged mice (GTM): two sets of genome-wide congenic strains. Genomics 74:89. Ellmeier, W., S. Sawada, D. R. Littman. 1999. The regulation of CD4 and CD8 coreceptor gene expression during T cell development. Annu. Rev. Immunol. 17:523. Zou, Y. R., M. J. Sunshine, I. Taniuchi, F. Hatam, N. Killeen, D. R. Littman. 2001. Epigenetic silencing of CD4 in T cells committed to the cytotoxic lineage. Nat. Genet. 29:332. Grizzle, W. E., J. D. Mountz, P. A. Yang, X. Xu, S. Sun, G. E. Van Zant, R. W. Williams, H. C. Hsu, H. G. Zhang. 2002. BXD recombinant inbred mice represent a novel T cell-mediated immune response tumor model. Int. J. Cancer 101:270.